The Penn State Graduate Research Poster Exhibition is coming up, and I’ve just finished (and submitted) my abstract! I would love any feedback or pointers. Highlights of the origins, interpretations, and influences of the Penn State Blue Out are analyzed by the graduate student co-founder and organizer to provide unequivocal access to a moment of effective grassroots activism. The Blue Out was the first and largest public response to the 2011 Sandusky molestation scandal at the Pennsylvania State University. Earlier in the year, fans were asked to wear white to the November 12 football game. This tradition, called a “White Out,” was intended to intimidate the opposing team. Students and community members began to support a “Blue Out” after Laura March discovered that blue was the nationally recognized color of child abuse prevention and proposed a change. The event provided a platform to distribute educational materials on child abuse, to collect funds for related charities, and to showcase creative expressions of solidarity with abuse victims and survivors. Only six days passed between the event’s inception and fruition. Background information regarding the sexual abuse allegations is detailed and the researcher’s personal connection with the football program, school, and community is clarified. A vacuum of university communication immediately following the breaking news is questioned, particularly as it further sustained a culture of silence. Out of this officially mandated silence, the Blue Out emerged as a proactive response to the scandal. The campaign’s goals are then considered and evaluated. As a community-wide event, the Blue Out demonstrated how positive social action can be fostered at the intersection of art education and instructional systems. Researching the visual culture and multimodal discourse that surrounded the event reveals how meaning is generated and disseminated within the context of digital communication. 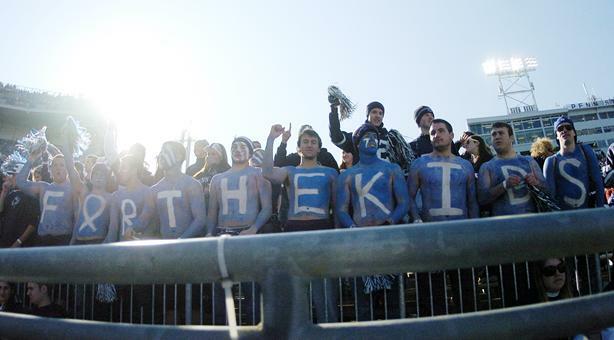 Visual culture theory enables the interpretation of the visual images, objects, events, and other cultural productions that were appropriated and reimagined by the Penn State community as a result of the Blue Out. Multimodal discourse analysis assesses the meanings generated through different media that promoted or criticized the event, such as digital photograph manipulation, blog posts, and social media commentary. Further examination of the social media response to the allegations questions the methods used by official outlets and the impact of censorship on public dialog. Other events influenced by the Blue Out are then examined, including a fundraising walk and the launch of a national children’s protection center at the university.